After a year of ruling the roost on Mata Nui, the Toa have some competition coming their way. Mysterious, insect-like creatures with elemental powers, the Bohrok move in swarms over Mata Nui. Mountains crumble and forests topple as they change the face of the island. In attempting to create worthy villains for the powerful heroes they had created a year before, Lego had to find a concept which recaptured the Bionicle line's initial successes: a variety of pieces and prices, collectability, and something that was just plain fun to play with. Not only did they manage to cover all this ground, but they also crafted a series that is more insidiously collectable than its predecessor. There are still the major figures, the Bohrok (BOW-rock), designed to fight against the Toa. They come in the same six colors as the good guys do, each with their own unique powers. Once assembled, they have a hunched-over stance which keeps them from looking as "human" as the Toa do. All the Bohrok have the same basic action feature: press a lever on their back, and they snap their head forward in an effort to dislodge their target's mask. The "masks" that come with the Bohrok are different than last year's Kanohi. Previously, there were six basic mask designs, one for each color of Toa. When you bought a Toa figure, you knew which mask you would be getting; you then bought mask packs to collect the other designs in that Toa's color. Instead of masks, the Bohrok have Krana. Molded from a softer pvc, the Krana rest in a tray inside the beast's head. Part brain, part mask, part living creature, the Krana share a symbiotic relationship with the Bohrok. They make the Bohrok smarter, stronger, give it powers and a rank within the insectoid legions, and even serve as a last defense: when hit in the eyes, the Bohrok's head flips open and flings its Krana at its attacker (the krana are molded to fit on the previous figures' heads). If it can connect with one of the Toa, the Krana can possibly take over their mind. There are eight designs of Krana, each with their own name and special powers, which they give to the Bohrok who wears them. An ice Bohrok (Kahnok) wearing the Yo krana is Kahnok Yo and is a mole. Give that exact same figure Za, and he's now Kahnok Za, squad leader. As before, the masks are available in special packs for only a few dollars, but there is a difference - when you buy one of the six Bohrok, you do not know which krana you will find within. Theoretically, in order to have a full hive, you would have to buy at least eight of every Bohrok. It doesn't stop there; just as the Toa had smaller sidekicks, the Bohrok have similarly-sized helpers. Are they baby Bohrok, larvae waiting to grow to full size? Are they misguided henchmen? Heck if I know, but they sure are cool. Each of the Bohrok Va have their own color of krana to collect and fling at enemies. Counting those sets, you now need to buy 96 pieces to complete your collection. If you want to find the Bohrok Va, you'll have to do some creative shopping. Lego is trying to reach out to new markets - pharmacies, grocery stores, gas stations and the like - many of which are reluctant to carry a toy they know will be easily found in a normal toy store. To help those stores feel more secure, Lego is not making the Bohrok Va available in such regular outlets as Wal*Mart, Toys R Us, and other major chains for a span of one year. Your best bet for finding these little guys - and they are worth the hunt - is at Meijer's or Walgreen's (that's Food Lion or CVS, to those of you on the East Coast). 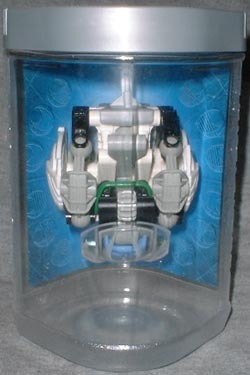 The Bohrok's packaging is also different than the Toa. Previously, the sets came in a tube with slots on top to store your masks. Now the tubes are more oblong, and feature no mask storage. They do have a really great new feature, though: instead of disassembling your figure to store it, you can roll it into a ball, simulating the bugs' hibernation stage. This ball can then be suspended from the inside lid of the tube. The back label peels off, giving you a nice view of your new figure hanging ready when you're not playing with it. The tubes stack vertically, of course, though not as snugly as last year's. Put them on their sides, however, and they pile up nicely. The oddly-shaped lids fit together to duplicate the large hives in which the bohrok sleep and wait. Since their introduction, Bionicle toys have been wildly popular. Now the heroes have worthy villains to fight, and we've got terrific new sets to play with.